On completion of his National Service with the 9th Queens Royal Lancers in 1955, vocalist Johnny Neal, who learnt his trade with the regimental band, was one of the first (if not the first) to appear both locally and nationally on the new emerging TV network which was in its infancy. He appeared on shows such as Lunch Box (presented by Noele Gordon); Come Dancing (from the Casino Ballroom Birmingham); and Palais Party Night from Hammersmith Palais Ballroom, London. Around this time, he featured on the Carroll Levis Show at the Birmingham Hippodrome and teamed up with the Mike Jacks Trio who were also appearing. Rock ‘N Roll was just taking off and Johnny added his old school chum Eddie Pepall on guitar and Alan Jaeger (saxophone) to the group, thus forming the first authentic Rock ‘N Roll group in the city (everyone else was playing skiffle). A little later, they became “Johnny Neal and The Houn’dogs”. The line up was Johnny (vocals), Mike Jacks (piano), drummer Brian Sharp (who later joined The Rockin’ Jaymen), Ronnie Hughes (double bass), Eddie Pepall (guitar) and Alan Jaegar (sax). They did the pilot for a Rock ‘N Roll Show for ATV and a little later the ATV Christmas show itself which was called Roll Back The Carpet, together with Pat Wayne and The Deltas. Johnny and The Houn’dogs – Mark 2 – also appeared on the Carroll Levis TV Show – the line up now was Johnny (vocals), Eddie Pepall, Brian Page and Tony Moore (guitars), Phil Moore (drums), and Brian Draper (piano). 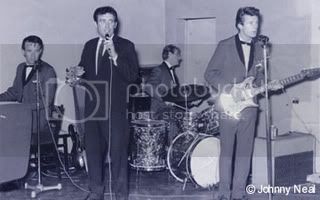 The Starliners were Johnny Neal’s next backing group and they had been formed about 1960 by original drummer Mal Davies. Graham Dunnet was the guitarist and Dario Capaldi played saxophone (there was no regular bass guitarist at that time). Johnny met The Starliners at the Sailors Return Pub and soon became their leader as they had no regular vocalist. Dave Rowe replaced Mal Davies on drums while Johnny Neal brought in pianist Ian “Monk” Mutch who also became the Starliners bass guitarist. Johnny Neal became a leader in the sixties movement with his new backing band and new manager Reg Calvert (who was also managing fellow Brum group The Fortunes). Reg Calvert sent Johnny Neal and The Starliners over to Hamburg, Germany where they took over The Beatles position at the legendary Star Club. While there, Tony Sheridan “borrowed” drummer Dave Rowe who ended up staying with Sheridan so was replaced by Londoner Terry “Franksie” Franks. Brownhills vocalist Tanya Day was also backed by The Starliners at the club. She introduced the band to The Beatles which resulted in Johnny Neal, The Beatles, and American singer Gene Vincent all getting “legless” at the pub next door! Dario Capaldi would later leave The Starliners to join Pat Wayne’s Beachcombers. As well as appearing at Birmingham’s Plaza Ballroom in Handsworth, Johnny Neal and The Starliners went on to entertain at various US bases throughout France where they also backed singer Paul Raven (later to become Gary Glitter) before returning to Birmingham and signing up with a new manager (who Johnny says was the best ever) – John Singer. After the Starliners returned from France, guitarist Graham Dunnet left and emigrated to Canada. He formed a group in Toronto called Dee and The Yeomen who were very successful locally and had several singles released in Canada. To read more about Dee and The Yeomen, visit their official website at www.geocities.com/deeman57. Although Johnny Neal and The Starliners had earlier recorded some songs for Decca Records (none of which were ever released), John Singer signed them to the Pye Records label in 1965 which resulted in the release of a single entitled And I Will Love You – an original song composed by Starliners guitarist Keith Dolloway. The B-side of the single Walk Baby Walk, was composed by American Air Force base employee Con Rich who offered the song to Johnny Neal when they visited the base in France during 1962. Despite its distribution in many countries, this was unfortunately the only record release by the group during the 1960s. Various “Starliners” came and went over the years, including Jon Fox (see Jon Fox and The Hunters and Cathedral, Keith Dolloway, “Moon” Shaw, Paul Brunt, Malcolm Priddy, John Andrews, Peter Wright, Stuart Duncan (Tiny Tim), Pete Oliver (Dead Legs), Mike Ellis (The Swede), Alan “Doog” Wishart and Alan “Clog” Clifford etc. 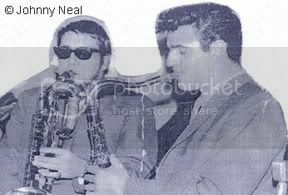 The later 1960s saw the formation of “The Johnny Neal Sound” which was a rhythm and blues line-up including various “Starliners” as well as Mike Burney (later to join Roy Wood’s Wizzard) and Paul Carter on saxophones, plus Ian Boyle on trumpet. Spencer Davis described The Johnny Neal Sound as “equal to the best of any hip London band” but despite successful appearances at the Cedar Club and Birmingham Town Hall, the line-up didn’t last due to the financial difficulty in supporting a seven piece band. 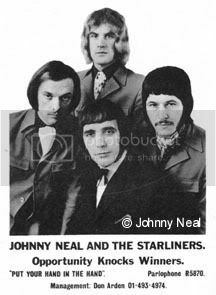 By the end of the 1960s Johnny Neal’s Starliners consisted of bass guitarist Barry Gray, drummer Roger Craythorne who had played in a band called “Sun Trolley”, and Geoff Nicholls (doubling on guitar and keyboards) who was previously in a West Midlands group called The World of Oz. 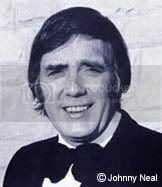 In October 1970, Johnny Neal got the biggest break of his career – an appearance on Hughie Green’s “Opportunity Knocks” TV Show, with the highest viewership of any other programme, eclipsing even “Coronation Street” and for 6 weeks “Johnny and the Starliners” were seen live by an audience of between 18 – 22 million people weekly. This was massive exposure – especially as Don Arden (see The Move) had seen the show, signed them up to a management contract, and rush-released their hit single entitled Put Your Hand In The Hand. This lead to other TV shows and BBC Radio One etc. topping the bill at cabaret venues around Britain and abroad. Geoff Nicholls eventually left The Starliners and joined the Birmingham group Quartz and later Black Sabbath. Barry Gray went to Canada, and Roger Craythorn is now in South Africa. Peter Wright (ex Trapeze) joined on bass guitar and was later replaced by Rex Harris (now in Australia).